Completed in July 2002, this innovative development at Earl Rise, Dundonald, has received a string of awards. The 32-house development represents the affordable rental component of a 20-acre extension to the village of Dundonald. The design is by Wren Rutherford A-S:L.
The basic requirement was to provide a range of houses designed with “lifetime” use in mind. All were to be capable of occupancy by a disabled person with the minimum of adaptation. Considerable weight was given to environmental responsibility in terms of choice of materials and minimising energy use. The primary “sustainability” goal was, however, to achieve a design of demonstrable long-term worth. The demand was for a high quality design, which could respond to changing needs and lifestyles. The houses would accommodate people with limited housing options and who were therefore likely to be long-term residents. The expectation was that they could be offered a house which was not only flexible in use but also “special”. To underline the demands of the brief explicit performance targets were set covering a range of functional and environmental issues. The site is on the crest of the hill in a very exposed position. The solution to this was to design the built form to give the least resistance to the wind and to protect the central public space. This has been achieved by using 1½-storey mono-pitched houses with the single storey facing out giving low resistance and the high side of the houses giving protection to the street. The wind is therefore deflected over the site. 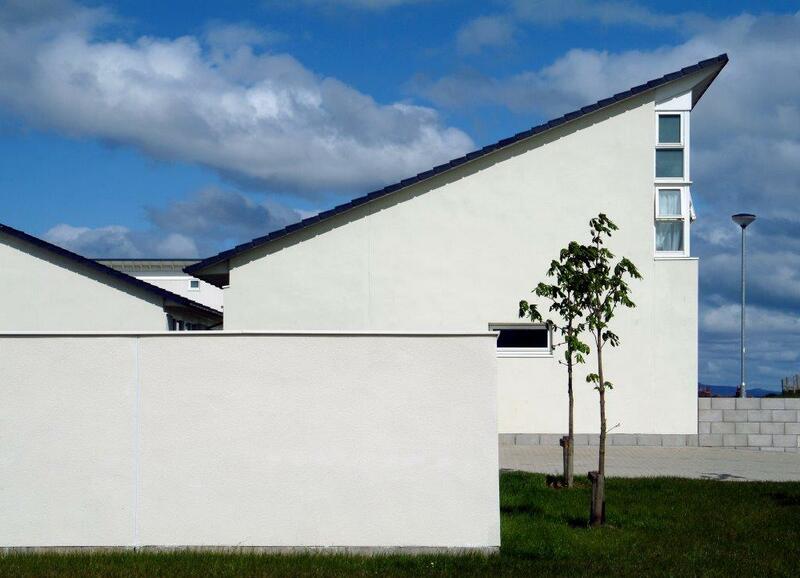 The houses have been designed to beyond housing for varying needs standards within Bulletin 1 house shell areas. All houses have been provided with a ground floor bedroom with en-suite shower room or wc to cater for disability if required. The living spaces are positioned on the private side of the dwelling with generous glazed areas facing the private gardens. The living spaces have large internal volumes with ceilings following the roofline and with the first floor bedrooms accessed from balconies overlooking the living space. This gives an illusion of space in houses built to housing association space restrictions. Ayrshire Housing always seeks feedback from its tenants on what they like and dislike about their homes. This is done once tenants have had several months to settle in. At Dundonald, the reactions have been overwhelmingly favourable. In addition, most local residents appear to see the modern design as a positive addition to their conservation village.